If you don’t already know, Flappy Bird is the hot new mobile game right now. The premise is simple: navigate the bird through the gaps between the green pipes. Tapping the screen gives a slight upward impulse to the bird. Stop tapping and the bird plummets to the ground. Timing and reflexes are the key to Flappy Bird success. This game is HARD. It took me at least 10 minutes before I even made it past the first pair of pipes. And it’s not just me who finds the game difficult. Other folks have taken to Twitter to complain about Flappy Bird. They say the game is so difficult, that the physics must be WRONG. Flappy bird doesn't obey any laws of physics!! I swear to god, the physics of flappy bird doesn't make sense at all! Like on what planet does anything fall that fast?!!?!? Have you ever heard of physics flappy bird?? The physics in flappy bird are just non existent. So, is the physics unrealistic in Flappy Bird? Sounds like a job for Logger Pro video analysis! I used my phone to take a video of Flappy Bird on my iPad. To keep the phone steady, I placed it on top of a ring stand with the iPad underneath. Then I imported the videos into Logger Pro and did a typical video analysis by tracking Flappy’s vertical position in the video. Sure enough, the upside-down parabolic curves indicate Flappy is undergoing downward acceleration. But do the numerical values represent normal Earth-like gravity or insanely hard Jupiter gravity? 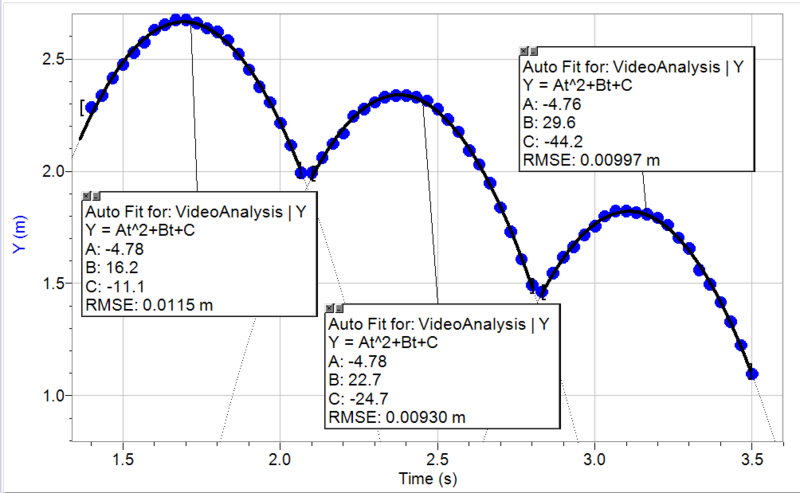 In order to do this, we need to (1) set a scale in the video so that Logger Pro knows how big each pixel is in real life and (2) determine the slope of Flappy’s velocity-time graph while in free fall, which is equal to the gravitational acceleration. The only thing we could realistically assume is the size of Flappy Bird. If we assume he’s as long as a robin (24 cm), then the slope of the velocity-time graph is 9.75 m/s/s, which is really close to Earth’s gravitational acceleration of 9.8 m/s/s. Flappy Bird is REAL LIFE. So then why is everyone complaining that the game is unrealistic when, in fact, it is very realistic? I blame Angry Birds and lots of other video games. Repeating the same video analysis on Angry Birds and assuming the red bird is the size of a robin (24 cm), we get a gravitational acceleration of 2.5 m/s/s, which only 25% of Earth’s gravitational pull. Here’s what I did: We determined from the analysis above that Flappy Bird is about 24 cm across. Conveniently, basketballs are also about 24 cm across. 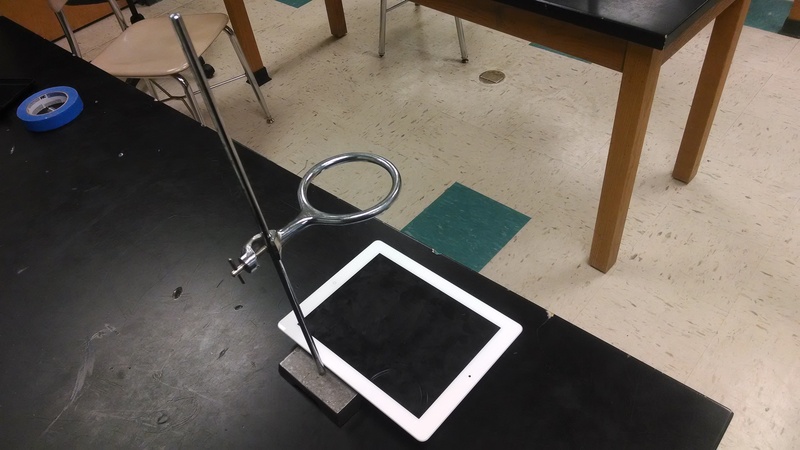 So I had my physics teacher colleague Dan Longhurst drop a basketball so I could video it with my iPad. Dan just needed to be the right distance away from the camera so that the size of the basketball on the iPad screen was the same size as Flappy Bird on the screen (1.5 cm). Next, I played the basketball drop video and Flappy Bird on side-by-side iPads and recorded that with my phone’s camera. Once I got the timing right, I uploaded the video to YouTube, trimmed it, made a slow motion version in YouTube editor, then stitched the real-time and slow motion videos together to create the final video you see above. As you can see, no matter what the pre-tap velocity (the velocity right before the graph rises up), the post-tap velocity is always the same (a bit more than 2 m/s on this scale). This means that the impulses are not constant. In real life, the taps should produce equal impulses, which means that we would see that the differences between pre- and post-tap velocities are constant. 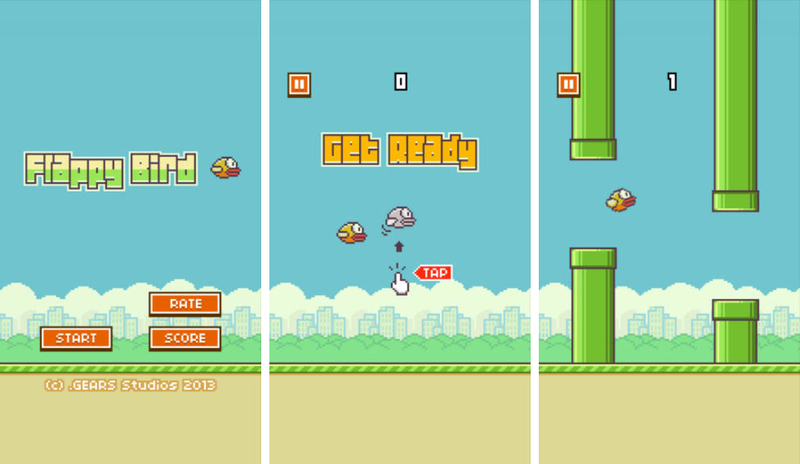 TL;DR: Is the physics in Flappy Bird realistic? Yes AND no. YES: The gravitational pull is constant, producing a constant downward acceleration of 9.8 m/s/s (if we scale the bird to the size of a robin). NO: The impulse provided by each tap is variable in order to produce the same post-tap velocity. In real life, the impulse from each tap would be constant and produce the same change in velocity. This entry was posted in Uncategorized and tagged angry birds, flappy bird, free fall, gravity, logger pro, physics, technology, video analysis. Bookmark the permalink. This will be a great inquiry activity as a comparison vs. Angry Birds. What about inertia and momentum? That’s where it feels unrealistic. I just posted an update analyzing the impulse from each tap. You’re right, it isn’t realistic. Each tap produces the same post-tap velocity, rather than the same change in velocity. From a coding perspective, this is because the acceleration is constant, but when you tap, it sets the velocity to the same value every time. This is why it feels unrealistic, because the tap directly sets the velocity with no regard to what the velocity was before. You’ve nailed it. My next project is to write a program in VPython that simulates Flappy Bird using both types of impulses — the “velocity reset” type that’s in the game and a “velocity change” type that’s consistent with real life. Superb analysis. This one post should be obligatory reading/viewing for every science student. Don’t accept. Don’t dismiss. CHECK IT! Thanks, Keith! That is huge complement and an honor coming from you. Glad you enjoyed it. I appreciate you writing my lesson plan for me! Used Flappy Bird physics to great end yesterday and today: http://mgolding180.wordpress.com/2014/02/04/day-105-flappy-bird-physics/. What about air resistance / aerodynamics? Shouldnt a bird with spread wings not accelerate at 9 m/s? You’re right. A real bird in flight also experiences lift, drag, and thrust and therefore is not a true projectile. However, the physics mechanics in the game of Flappy Bird (and Angry Birds) treat the birds like projectiles, as my analysis shows. We are learning about this general topic in my Physics class. Yes, this game does seem unrealistic. It doesn’t take in the inertia and momentum concepts along with the velocity issues. Whether acceleration is constant and the velocity doesn’t change from the previous tap, the game should still take into consideration the change in velocity. Like you said before, the game treats the bird as a projectile. I think to make the bird more realistic, they should put in some extra additions to make the game more realistic, less difficult, and more fun! I am ecstatic that you have proven that their is a little bit of Physics in the game Flappy Birds. Its wonderful to know that you can play a game and learn and apply the laws of Physics at the same time without knowing. I would like to know are there other games out there that can be applied to science? The great thing about video games is that they become a new worlds for determining the laws of physics. Angry Birds is one game I’ve written about a few times (see the link up top in blog header). Angry Birds Space is good too. You should read Rhett Allain’s “Dot Physics” blog on Wired, he has many posts about video game analysis (Fruit Ninja, Angry Birds, etc). Another game which comes to mind is Refraction. It involves lenses and mirrors to bend and combine/split light. It has some good physics and some bad physics. The challenge for students would be to explain what’s right and wrong about the game. Glad you enjoyed the Flappy Bird analysis! He simply reset the velocity to 0 immediately before he applied the impulse. This is fantastic! I am going to use this in my 8th grade math class. Could you share your data? I would love to have the kids analyze it. Flappy bird is the most addictive game i ever played.